As a naturalist, I know more than the average person about mule deer (my first up close encounter being when I was six years of age, in fact). And, as a humanitarian, I am against the abuse of animals-or of humans. Human behavior and politics fascinate me, and to put it simply, for a democracy to work, I think we need openness, transparency, and public input into the process of governing. Which brings us to Mayor Lee Pratt and the council of Cranbrook: a lovely town nestled in the Kootenay Valley of south-central British Columbia. It was this council that took actions that led to the abuse of deer fawns (and did so, it appears, in utter secrecy). Abusing? Have a look here and make up your own mind. (Warning: watch at your own risk.) And, if you think I'm just too squeamish and care too much about not abusing others, especially animals, I assure you that even hunters with whom I have spoken are also disgusted by what went on. What we see is video that was taken in the dark of night early in January. Cranbrook has a history of killing deer. There are "too many" for many of the good citizens of Cranbrook and so council is dedicated to killing them. Contractors are issued permits that have certain specifications that they can fail to meet with impunity, since it is all done in secrecy under cover of darkness (or would be, but for the fact that some good citizens managed to catch some of the culling on camera). In the first video, we see a fawn in a "clover trap," which is essentially a box-shaped collapsible framework covered with mesh and big enough to hold a deer. It is baited, and when triggered, the door closes and the deer is trapped. The cull contractor is supposed to arrive, quickly collapse the trap down on the deer, essentially jump on the struggling animal, place a captive bolt gun against the terrified animal's head, and fire a bolt into the brain. And then, the deer is to be quickly bled out. What we have been told is that, when a deer is in the trap (designed to hold one animal only), he/she will lie down peacefully. No stress. All, we are told, is humane. But, the images on the first video show a different situation, with the captured fawn pacing within the trap, stressed, wanting out. This goes on for at least two hours, maybe longer. Next, we see two cull contractors arrive. (We blurred their faces to protect their identities.) They collapse the trap onto the fawn and shoot the bolt into the animal's head, and then stand up. The fawn moves, so they fire the bolt into the young animal's brain a second time. The fawn still keeps moving as the cull contractors start to erect the trap. They drop it again and watch the struggling animal. It looks like they might try to bolt the fawn a third time, but instead, they simply grab the animal by a hind leg and drag it out of the picture, two legs still kicking. Once the humans have left, we see the doe and surviving sibling return. According to the permit (page 6), "Two (2) contractors will quickly collapse each Clover trap with the deer inside and dispatch the animal immediately and humanely with a bolt gun; Contractors promptly re-establish the trap from its collapsed state, open the gate and move the deer into a plastic sled for transfer to a waiting vehicle; deer must not be visible while in the vehicle." It also states that the cull contractor "ensures that the wildlife are treated as humanely as possible during all phases of the product." I don't consider such treatment "humane" by any definition of the word. A second video shows another fawn in another trap. But, looking closely, we see that it is not one fawn but two, and that the trap, which is supposed to be upright when an animal is in it, has collapsed, pressing down on the two fawns. They remain pressed down, helplessly entangled, for at least two hours, in the snow, until the cull contractors finally arrive and kill them. We have often asked for data to be collected that allow the public to assess the humaneness of this culling. But, no such data are made public (if they are even collected). Deer are sensitive animals and the stresses of capturing and killing need to be better understood-not shrouded in secrecy. In fact, no meeting was held until after the video was made public. While I "get" that Mayor Pratt and the Cranbrook council don't want their constituents-whose taxes pay for all of this-to see what the videos show, our system must be open and inclusive. The citizens of Cranbrook, whether they hate or love deer, deserve better. Most of the traps are not within the core of the city, but near the edges, adjacent to natural deer habitat. 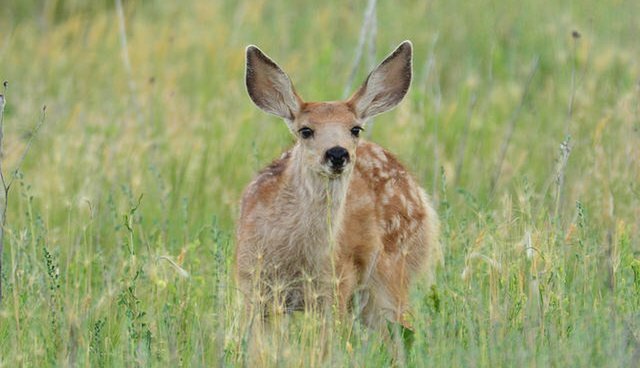 Ironically, in British Columbia, the mule deer population is in decline, and no one really knows why. Yes, there are concerns about deer in urban settings eating garden plants and being hit by cars. It should also be noted that deer and dogs don't mix, and that protective dogs may aggressively protect their young (and bucks will snort and challenge, although actual contact is easily avoided). But, randomly killing fawns who come in from the forest isn't going to do much to prevent that-and, it's just plain brutal. Other communities in British Columbia, where there are concerns about deer in town, are openly seeking non-lethal solutions. Cranbrook, however, remains shamefully secretive and cruel.